Episode # 12 Is LIVE with the very talented Kerrie Kelly! It’s such a small world when you meet someone through social media and become good friends only to find out later that you both went to the same college and have a love for the same things. That’s how my friendship with the beautiful Kerrie Kelly all began. I knew when I started this podcast I wanted to have her on the show because she has been so successful with her Interior Design business on many different levels. Have you ever wondered how designers create their own home decor product lines or how they collaborate with big brands? In this interview with Interior Designer Kerrie Kelly, she shares how she connected with home decor companies such as Feizy Rugs, Coyote Outdoor Living, Go Home, LTD. to design collections for them. That's just the beginning. We also talk about the many avenues an Interior Designer can branch into and the multitude of different projects she's been involved in, including being a spokesperson for Zillow, a home contributor to Style Magazine, national board member to the American Society of Interior Designers (ASID) and a member of the editorial board of Furniture, Lighting & Decor Magazine. Kerrie also shares a wealth of great advice for young designers and anyone interested in living out their dreams as a creative entrepreneur. Episode # 11 is LIVE and it is full of Inspiration! 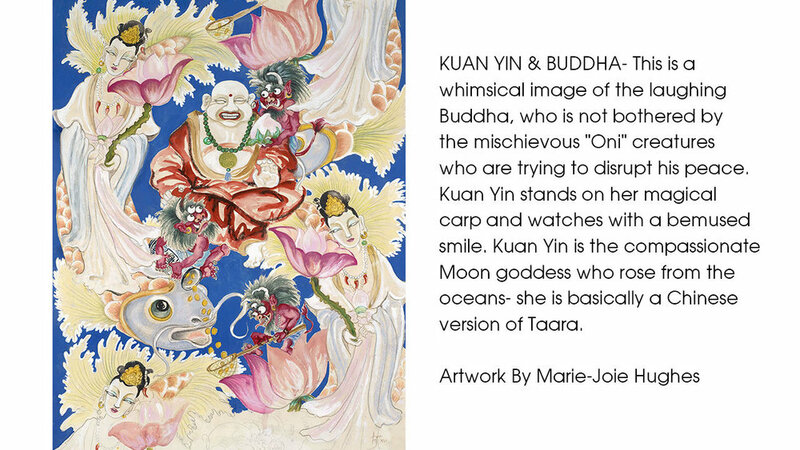 She's been named one of "The 7 Next Big Thing Artists" by Elle Decor Magazine and once you see all her beautiful artwork, you'll know exactly why. If you ever wondered what it would be like to live a life as a full time mixed media artist then this is the episode for you! Kristi Kohut had a very successful career in the world of advertising but when her son was born she knew it was time to follow her passion of creating art. Through many hours of trial and error, infused with a lot of Play, her artistic creations began to take form, many of them 3 dimensionally. In her interview we talk about how she creates her colorful pieces of art and sculptures which is a process unlike any I've ever heard about. We also discuss her creative approach on how she sells her art to collectors and interior designers. 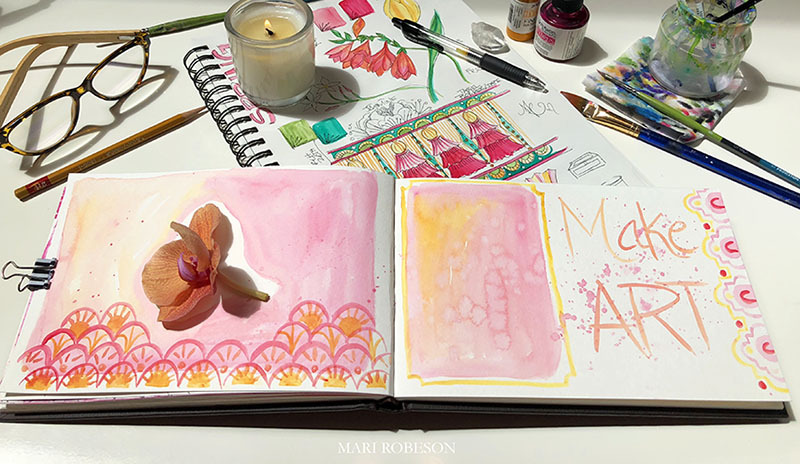 This inspiring creative journey through the eyes of Kristi Kohut will make you want to surround yourself with her Colorful ART! As this Vlogcast has evolved I’ve examined different ways to include the artist in the Give Back component. Not only is the Featured Artist sharing valuable advice to younger creatives, they are generously offering 20% of the Sale of a selected piece on their site to the Louise Monforte Memorial Scholarship. This offering is only good for the month they are featured. I’m thrilled to announce that this gorgeous piece by Kristi Kohut is our selected piece of art. You can purchase this piece HERE. Titled ‘Be Vibrant’ - so perfect for the month of LOVE! Introducing The Brilliant Erin Summer - January's Featured Creative Entrepreneur! EPISODE #10 is LIVE and you are all in for a real treat! Erin Summer is an Art Director, Content Creator, Photographer, Color Enthusiast and Crazy Dog Lady! What’s not to love about all of that?! Erin and I met on Instagram and I instantly fell in love with her colorful, quirky, playful graphics and gifs. But come to find out that is her New Account. Previously Erin created some of the most gorgeous feather accessories I have ever seen! @ErinLightFeather on Instagram Unfortunately (or fortunately) a health issue forced her to reinvent herself into her new career as the Creative Art Director of Erin Summer where she creates graphics and branding for companies big and small. On the EPISODE we dive into how this transformation happened for her and the amazing companies she now works with. Erin shares some really wonderful advice on how she overcame a difficult challenge to find her true purpose as an artist and creative entrepreneur. We also talk about the different platforms where an artist can sell their work such as Red Bubble, Society 6 and ETSY. Super interesting! Happy New Year! Meet January's Featured Artist - Gina Julian! I can’t think of a better way to start the New Year but with the incredibly talented, abstraction artist, Gina Julian! You can listen, and watch, her EPISODE HERE! Gina and I became friends via Instagram a few years ago. I’m so drawn to beautiful, colorful art and her work does not disappoint! Before she created her latest OP Art series I was fascinated by her colorful portraits, which come to find out, are all created on her computer! Amazing! In her interview she shares a lot of helpful advice for artists and how to promote and sell your work. I loved her tips and plan on incorporating them into my own business. Gina is my First Featured Artist of the New Year and I couldn’t be more honored to share her work with you! Because Gina is the featured artist, two of her beautiful Origami Art Prints will be available in the in Give Back Category of my online Shop for the month of January, 2019. 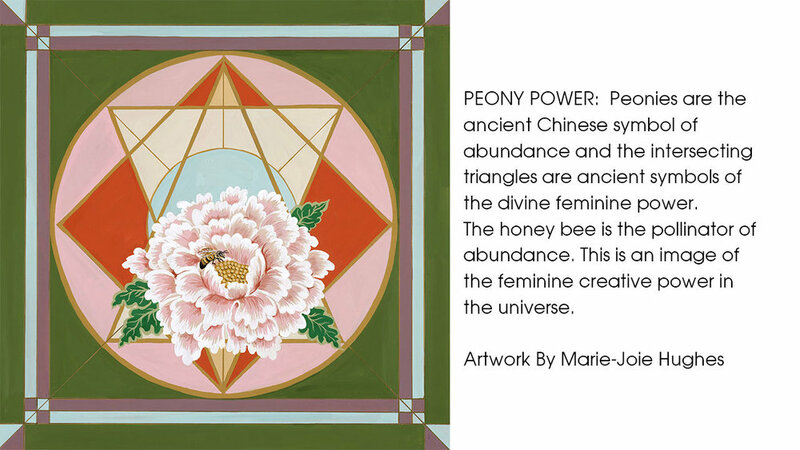 The proceeds from the sale of these monthly artist prints go to the Louise Monforte Memorial Art Scholarship. The first of these scholarships will be awarded this Spring! Happy New Year everyone and please enjoy this very colorful and fun interview with artist, Gina Julian! I can’t think of a better, more creative person, to end 2018 then my dear friend, the very talented Interior designer, Abbe Fenimore of Studio Ten 25! Listen & watch her Podcast Episode Here. Abbe’s GORGEOUS home office! Just a small taste of how talented this lady is! It was such a treat to interview Abbe for this month’s Featured Podcast Episode because I have been a huge fan of her beautiful designs for a very long time. In the episode she very generously shares what it's like to own a design business, from how she began, to what it's like on a day to day basis. Abbe is one of the very few designers that actually inspires me so much that I want to paint her rooms. Among a very long list of successes, which she is very humble about, Abbe has been named the Best Interior Designer in Dallas, Texas since 2012. Her bold, colorful and sophisticated style has led to her being featured in Apartment Therapy, Rue Daily, The Washington Post, The New York Times, HGTV, Better Homes and Gardens and many more shelter publications. You can view them HERE. This was a project we collaborated on. 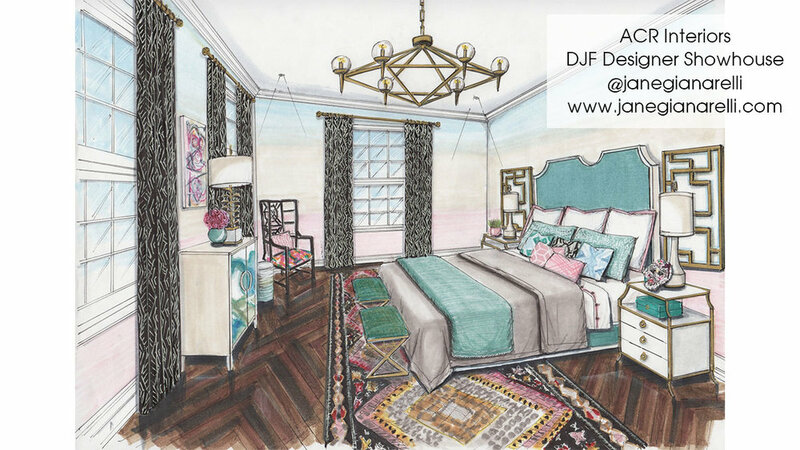 I designed the watercolor fabric for her drapes in this beautiful home she designed. You can see more pictures of it HERE. I hope you will find a little time, perhaps when your wrapping all your holiday gifties, to listen (and watch) her Interview. This episode is especially insightful if you are interested in Interior design; becoming one or hiring one. Happy Holidays and Thank You for supporting the ARTS! Welcome to December! 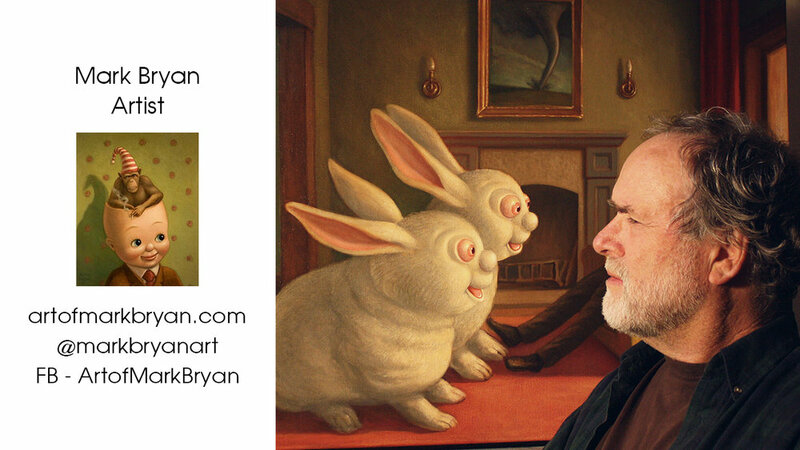 This month's Featured Artist is the very, VERY talented, Mark Bryan. Some art is pretty to look at. Some art is an optical illusion. Then there is art that makes you think. Mark's art is the latter of the three. Every painting takes the viewer deep into a story of what dreams, maybe nightmares, are made of. Add the fact that Mark is a true Master at his craft, it becomes hard to believe that some of these creatures may not actually come to life at any moment! There is so much going in on his paintings, I just had to know more. So I asked about who he was and when I realized he lived very close to me I was hoping I could have him as a guest on my podcast. Much to my surprise, he graciously said yes! You see, I think Mark is kind of a big deal. He is very accomplished and has exhibited his work all over the world. He has created numerous book covers and has been the featured artist in several magazines including Juxtapoz and several others. He has a MFA from the prestigious Otis Art Institute in Los Angeles and started his career working with the early founders of the Chicano Art movement (Los Four). You can read his impressive biography HERE. Some of Mark's work will definitely hit a nerve and make some feel uncomfortable. It actually did for me at first but after I interviewed him and I understood how all of his life's experiences would lead him to being this type of a painter, it all made complete sense. Mark's work makes you feel and question and think about things. He is, in a way, documenting current events and presenting his opinion on them in the form of art. This is something I really love. Free Speech at it's finest! So maybe you won't agree with what he's saying with his art or maybe you'll be like many who thank Mark for "painting the way they feel". Which ever side you're on, this is noteworthy art and I feel incredibly honored to have had the opportunity to meet and interview him. Beyond some of his more famous political satirical paintings, there are other more surreal, whimsical ones that I like so, so much. The two below are some of my favorites! That’s why I’m so excited that for the month of December Mark has graciously offered these two prints for sale in the Give Back category of my shop. He is also generously waiving his commission so that 100% of the proceeds can go to The Louise Monforte Memorial Art Scholarships. Did I also mention what a kind and exceptional person Mark is?! 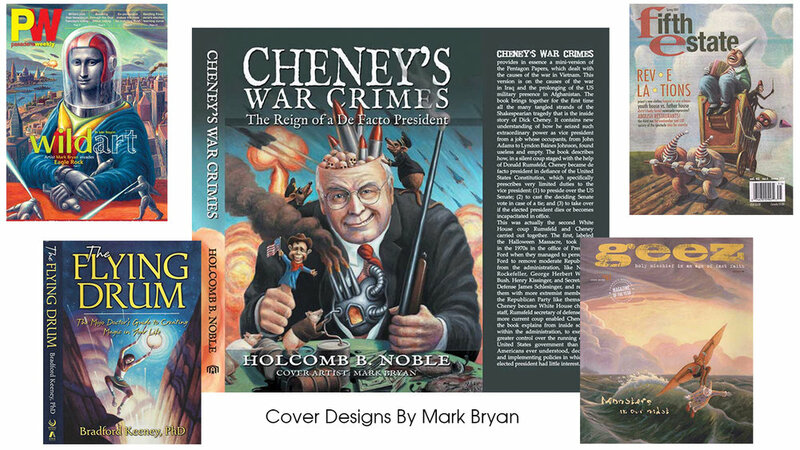 I sincerely hope you will have the chance to listen, and watch, this super interesting interview with the very talented Mark Bryan. If you're looking for a great gift you might also consider adding Mark's book to your library! You can purchase it HERE. If you live on the Central Coast you can see Mark's current exhibit of paintings in person at Frameworks Gallery in San Luis Obispo, CA. They say timing is everything and in this case I couldn't be more excited to share my incredibly talented friend, Christine Mason Miller in Podcast Episode #4, the day her New Book; The Meandering River of Unfathomable Joy, is officially released for Pre-Sales! But first, a little about this amazing woman. I met Christine years ago when she had a very successful greeting card company called, Swirly. I was just starting out with my own greeting card company and reached out to her. At the time she was living in beautiful Santa Barbara, just about an hour South of me. Almost instantaneously, we became fast friends and kindred soul sisters in the land of creativity. Through the years Christine has had an incredible career as an artist, author and teacher. In fact, I'm sure you would recognize her work because it has been successfully licensed all over the world. She has taught on-line courses, created inspiring retreats, written and illustrated five books, to just name a few of her outstanding accomplishments. So you would think that would lead to a person with a huge ego but in fact, the opposite is true. When you visit Christine's website, the first page you will land on is one of my favorite quotes from Mother Theresa. Christine truly lives and acts by these words. There are very few people I have met in my life that have impacted me in such a positive way. I will share with you that when my sister passed away, I had hundreds of books that were pre-sold that I needed to pack and deliver. I was in between a state of shock, grief and feeling completely overwhelmed. Christine drove up from Santa Barbara, gave me a huge hug, then said, "How can I help you?" Those 5 words....saved me. Then for 2 days we packed up and shipped out all the books. I can not tell you how much that meant to me and how inspired I am by her "small acts of kindness" that she delivers with "great love". Almost two years later and a lot of personal growth, I will never be able to show her how grateful I was for her presence at one of the most difficult times of my life. I wanted to share this back story with you because this is the essence of who Christine is and it shows up in all her art, her teaching and her books. In fact, when I read this book it made me think of traveling and every day life in an entirely new way. To focus on the blessings in the most difficult situations. To show up for life fully, without regret. To grow in the most uncomfortable places of ourselves. In her Podcast Episode we discuss why she created the book and how she "discovers a place of deep, abiding faith that affirms her spiritual journey around every corner, teaching her what it means to embrace what is, to live in gratitude, and to surrender to the flow of each moment." When I read her book I found myself hanging onto every word as she invited me into her enchanting and inspiring adventure. Not only is the book visually gorgeous, I found myself laughing, and at times crying, as if I was one of her girlfriends traveling with her on a soulful adventure of a lifetime. I've already ordered mine! Pre-Sales of the book are Now Available HERE! In my podcast interview with Marie-Joie Hughes she offers a wealth of insight into what it's like to work for the lifestyle companies we all know and respect. Her journey as an artist is incredibly interesting and she offers helpful information for those interested in pursuing a career in commercial design. You can listen to the full Podcast Interview Here! Here is a little more about her creative journey and what Marie-Joie Hughes is creating now. Her story begins like most people in the arts. MJ started drawing as soon as she could hold a pencil. She always drew wild costume images. Even as a tiny child she would take out the historical fashion books from the library, and then create historically accurate paper dolls. Costume design has always been her true passion. She was more into the illustration aspect than sewing. She believes she has been very lucky to have had many people in her life, mostly women, who really encouraged her and pushed her to succeed. She came from a lower middle class background, but was determined to go to art school even though her father told her she would never make it as a designer and should study something practical like accounting. Fortunately through a friend of her parents she got a job as a textile designer's apprentice right out of high school. She showed Betsey Lamonte, (the designer who she claims changed the course of her entire life), her wild costume illustrations. Because she could paint with gouache, she was hired. MJ had to drop out of art school a year later, because she became extremely ill. Since Betsey Lamonte became the head of textiles at Esprit de Corp, she got a full time job designing the Esprit Kids textiles. She was only 19. Aside from doing some costume work in theatre and independent film, she has been designing textiles and doing surface design for companies ever since. As in most businesses, the industry is small and one job always leads to another based on the reputation of your work and who you know. She felt extremely lucky to get into the Williams-Sonoma group 20 years ago. She started free-lancing for Gardener's Eden- which at that time was owned by Williams-Sonoma. All the connections she made over the year started with the woman who trained her, Betsey Lamonte. Mary Britton-Rose who hired her for Gardener's Eden moved to Restoration Hardware, so she went to Restoration Hardware. After a few years she went back into the Williams-Sonoma brands because she was offered a job at Pottery Barn. 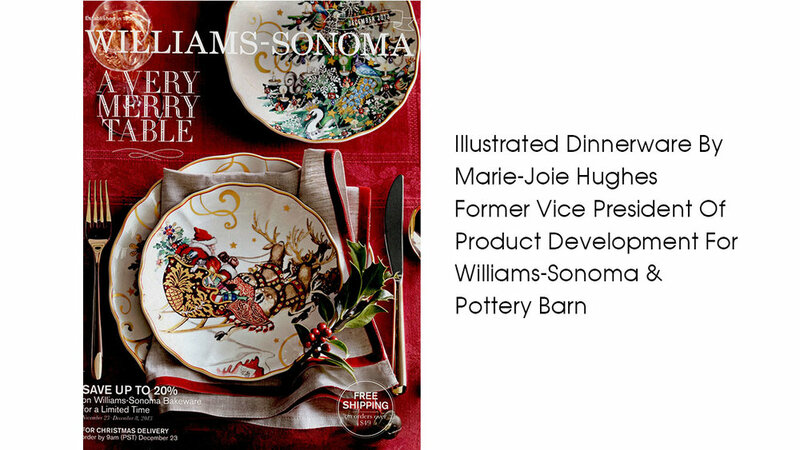 She stayed with Williams-Sonoma Inc for 13 years. Two years ago she left her position as the Vice President of the Product Development Studios for both Williams-Sonoma brands and the Pottery Barn Main brands. The two design teams she lead, created the artwork for not only the textiles categories but also dinnerware, wall art, some packaging and many decorative accessories that required artwork. Why did she leave? In her words, "Product design is truly created in the factories by armies of craftspeople and workers. It literally takes an army to make a duvet and sham set. I love working in the factories. I started working in the factories in Hong Kong over 30 years ago. I left my executive job to work deep in the factories and help train the young design teams in those factories. The factories are the wombs of creation. I like to be where the action is and I am passionate about teaching and guiding the next generation of designers into designing a more creative and sustainable world." 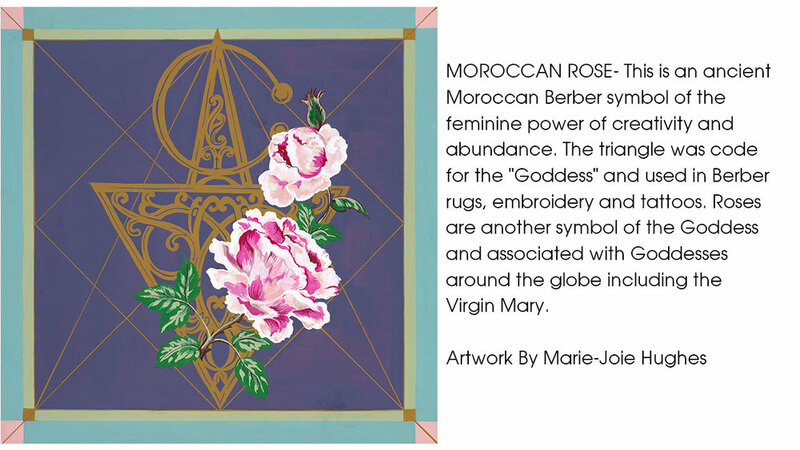 Marie-Joie has recently launched her own collection of wall art and textiles with deep spiritual meaning and symbolism. 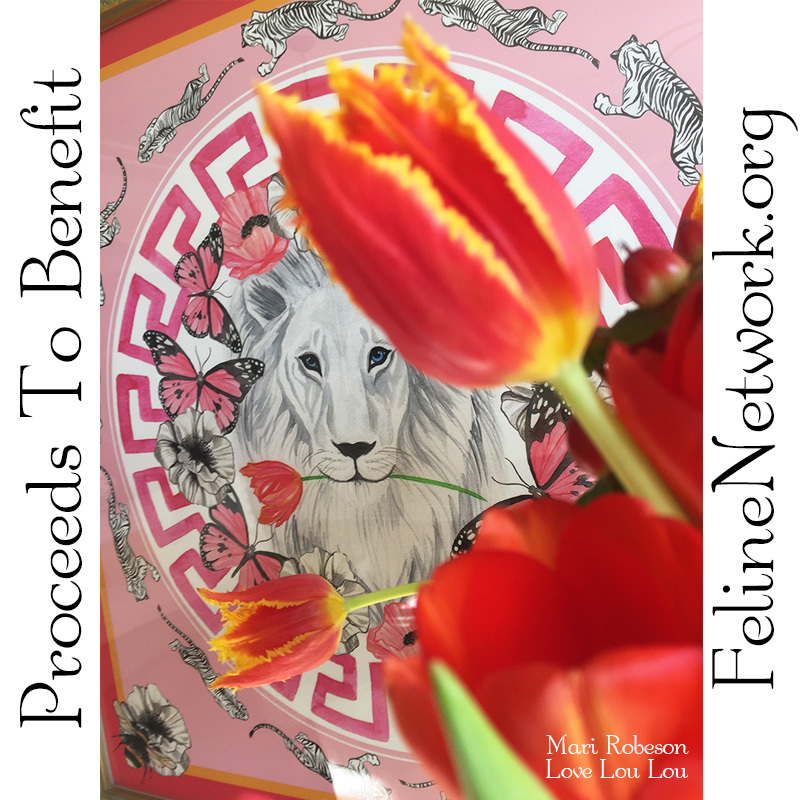 If you choose to purchase any of her art in the month of Sept 2018, in the GIVE BACK Category of my online shop, she will receive a commission and the remaining proceeds will go to the Louise Monforte Memorial Art Scholarship, an educational scholarship available to support the next generation of artists! The scholarship will be available to high school students of Arroyo Grande High School, Spring 2019.